A couple of years ago, we asked women attending the radiology practice for a mammogram the most important factors influencing the experience. The most important factor was the radiographer; the person doing the mammogram. They are in a unique position: they meet the client, they have a chance to chat to them and they do the actual mammogram. To them, there is a person behind the picture. They are the ones who can pick up if there is a clinical problem noticed by the woman herself or the referring doctor. Every year, Lettie Greef runs a course on behalf of CPUT for radiographers specialising in mammography. I teach have an hour or so to teach them about the clinical aspect of the management of breast cancer. This includes diagnosis and treatment of breast cancer. It is a big ask! This year, the task was made slightly easier as they were all given a copy of the book "Breast Care" sponsored by Bergman, Ross and Partners. 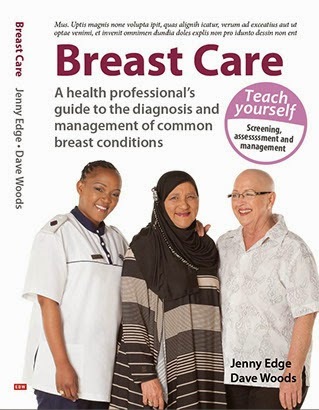 The book is primarily aimed at nurses working in primary clinics and seeing women with breast problems. As it covers examination of the breast and normal changes of the breast, it is useful to other medical practitioners including radiographers. We have had a number of radiographers coming to our courses. Please feel free to contact us if you are interested. Once again, thank you to Bergman, Ross and Partners. It is good to have such kind of courses. it can give a lot of education and knowledge. I t would be great if you can held it internationally so that we all can take part.